When I was newly sober I was only thinking of alcohol as a beverage I consumed in a glass. As time went on I began to find myself in a restaurant with choices like Beer Battered Fish and other dishes which use alcohol as an ingredient. I had a choice to make; do I choose to consume alcohol on any level? My personal answer was no, I will not ingest alcohol in any form. Now I am aware that alcohol can be burned off in cooking but if I were to order up a dish in a restaurant can I be certain the exact temperatures/methods have been used. Ultimately for me it was a no-brainer, I am not willing to take a chance that I’ll psychologically let myself have “just a bit” at some stage in future. Wether you’re abstaining because of addiction, pregnancy, your faith, health or any other issue the fact is alcohol is used in many recipes which we sober folks would like to enjoy. 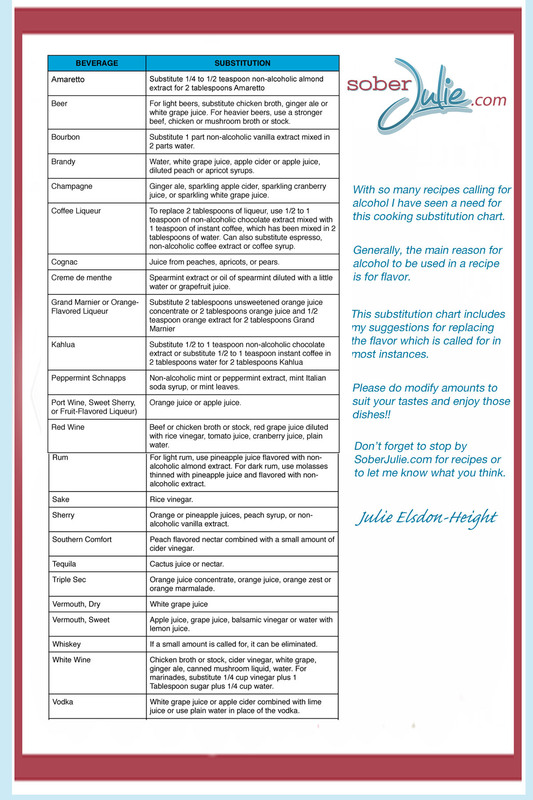 I’ve complied this Alcohol Substitution Chart with the help of a fine Chef and some fabulous foodies. This may not be the perfect list for your taste buds but by testing the measurements, I’m sure you’ll find the right combination for yourself. Please feel free to print, Pin, Share and tell me what you think! 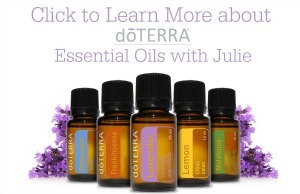 I love this Julie, what a great way to substitute. I personally stopped drinking quite some time ago, not from substance abuse but just grew tired of it and the effects and it is nice to see a list like this as I am a cooking machine and many recipes I have skipped because they called for alcohol! I’m so glad you find it helpful Aimee! This is brilliant Julie, so practical. I never have liqueurs or hard liquor in the house so it’s handy to have all of these substitutions. By the way, I really admire your top-to-bottom resolve too. Thanks so much for this, Julie. I bake and cook with alcohol a lot and because it is cooked off or evaporates, never thought much about it. It never occurred to me culinary uses for alcohol could be an issue for anyone. Clearly, I was wrong. I will definitely print out this chart and keep it on hand as a reference! Thanks again for this practical chart! Thanks for reading and printing as a resource Charmian!! So glad this will help! I frequently passed on recipes calling for alcohol, not wanting to purchase a whole bottle to only use a couple of teaspoons in a new recipe. Your list will be a budget -boosting boon, and expand family recipe collections to include more recipes that many people may have ignored in the past. This is fantastic… sharing all over the place because it is a great resource! Thanks Julie! Thanks for posting this Julie! With the farmland being swallowed up by wineries in Niagara and alcohol finding it’s way into everything on menus from onion rings to pasta dishes, I find it increasingly difficult to find places to dine where I won’t be overwhelmed by the flavour of alcohol in food. I can’t wait to Share with with other Sober Friends! This is great! I pinned it for future reference! Great Chart – you really did your research and covered everything! Ginger Ale is a great substitute for Champagne. Never thought about it as a beer substitute but it makes perfect sense.